Queer Threads: Crafting Identity and Community, curated by John Chaich, presents 26 artists from 4 continents who are remixing fiber and textile craft traditions and materials to explore contemporary lesbian, gay, bisexual, transgender, and queer identities and ideas. 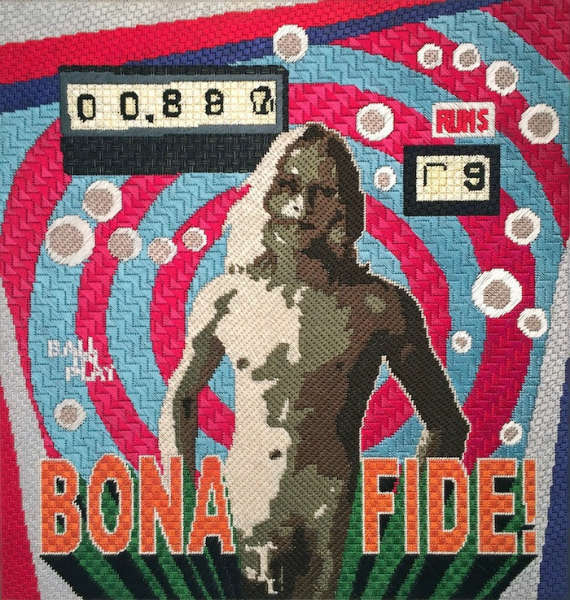 Queer Threads was first exhibited at the Leslie-Lohman Museum of Gay and Lesbian Art, New York in January 2014 and marked the first exhibition expressly examining contemporary queer fiber art practices. Feature artists: Chris Bogia (New York), Melanie Braverman (Massachusetts), Jai Andrew Carrillo (California), Chiachio & Giannone (Argentina), Liz Collins (New York), Ben Cuevas (California), Pierre Fouché (South Africa), James Gobel (California), Jesse Harrod (Virginia), Larry Krone (New York), Rebecca Levi (New York), Aubrey Longley-Cook (Georgia), Aaron McIntosch (Maryland), Allyson Mitchell (Canada), John Thomas Paradiso (Maryland), Sheila Pepe (New York), Maria E. Piñeres (California), Allen Porter (deceased), L. J. Roberts (New York), Sonny Schneider (Denmark), Buzz Slutzky (New York), Nathan Vincent (New York), and Jessica Whitbread (Canada).